Project Safe Center staff are available 24/7 to provide accompaniment to Vanderbilt University Medical Center Emergency Department for treatment post-assault and/or for a forensic examination. SafeVU SafeVU is a mobile safety application for iOS and Android smartphones. The app allows users to connect directly from their cell phones to the Vanderbilt University Police Department. With SafeVU you can contact VUPD for emergency services with two easy taps, submit non-emergency reports to VUPD with text, photos, or videos, submit information to VUPD anonymously, assign contacts to monitor your safety at your request, access information about Vandy Vans, and view VUPD emergency guides. SafeVU is free, available to anyone, and available for iOS and Android. The University Counseling Center (UCC) offers individual psychotherapy as well as an ongoing support group for victims of sexual assault. For more information, visit their website or call (615) 322-2571 . The UCC Acute Care Team (ACT) staff members are available to respond to students affected acutely by a traumatic event, such as sexual assault. Please contact the UCC (322-2571) and ask to speak to or schedule an appointment with a member of the ACT team if you think you may benefit from this service or if you have recently experienced a traumatic event and would like support. The student may request to speak with either a male or a female member of the ACT team. Urgent Psychological Crisis/Triage: Monday 8:00 AM-4:30 PM and Tuesday-Friday from 9:00 AM-4:30 PM, you may come into the University Counseling Center and be seen by the clinician on triage, or you may call the University Counseling Center at (615) 322-2571 to speak with triage clinician. The University Counseling Center is located at 2015 Terrace Place (across Terrace Place from the Baker Building). After 4:30 PM, if you are experiencing an urgent psychological crisis, you should go to the Vanderbilt Emergency Room or the nearest Emergency Room for acute assessment and support. If you decide not to go to the Emergency Room then you may call the UCC after 5PM (615) 322-2571 and, through an answering service, you will be connected to the clinician who is on call at that time. Students exposed to HIV (or have had a high risk but unknown exposure such as sexual assault) should start medication as soon as possible after exposure. Students should contact Student Health for a same-day appointment or if after-hours (and without access to Student Health within 12 hours), students should contact the after-hours emergency line at 615-322-2427. YWCA Crisis and Information Line: (615) 242-1199 or toll free 1-800-334-4628 . 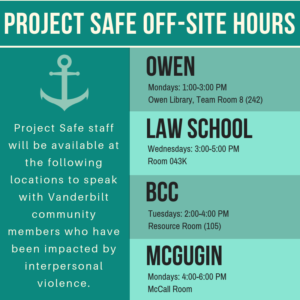 Vanderbilt Project Safe staff are available at the Project Safe Center, 304 West Side Row, Monday – Friday, 8 a.m. – 5 p.m.